This past weekend, my lovely wife, daughters and son-in-law treated me to a weekend at the historic Willard Hotel in Washington DC. For those of you who don't know the Willard, it has been witness to the political history of Washington as well as the nation. The Willard is located at 1401 Pennsylvania Ave about 2 blocks from the White House and right next to the Treasury building. It is a beautiful and stately building which takes you back to the splendors of the 19th century. 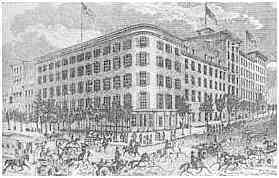 The current hotel was built in 1847 when Henry Willard combined six separate buildings (built starting in 1816) into a general overall structure. The hotel has been improved over the years and the current structure was formalized in 1901. For those who know their Civil War history, it was the place that Ulysses Grant stayed when he came to Washington with his son to accept command of the Army of the Potomac. It has been the location preferred for political debate, military reunions and gentry use in years gone by. Abraham Lincoln stayed in the Willard prior to his first inauguration in 1861and wrote his first inauguration address while he was there. President Grant frequented the hotel during his 2 terms and spent time in the lobby of the hotel meeting with special interest representatives coining the term for these men...Lobbyists. The MLK memorial in Washington DC. The table used by MLK to write his famous "I have a Dream Speech"
When we checked into the hotel last Saturday, the hotel manager struck up a friendly conversation with me and then to my surprise, upgraded us to the Martin Luther King, Jr. suite....the suite that he used to pen the famous speech. What a room! Besides the beauty of the suite itself, the sheer historic significance of the room and actual place where history was made....was awe inspiring. The Willard has a small hotel museum inside that gives a small glimpse into the history of the hotel. One of my favorite parts was a excerpt from Charles Dickens during his visit to America and Washington in 1824. He was NOT a fan. Dickens stayed at one of the many buildings that eventually evolved into the Willard of today...but in 1824....Willard it wasn't! Cherry blossoms and the Jefferson Memorial...1 day late. With 2011 being the 150th year since the start of the American Civil War, I thought it would be appropriate for me to share letters written by my great-great grandfather, John W. Derr during the course of the war. I will be posting each letter on the 150th anniversary of their creation. Since Private Derr did not write his letters in a consistent pattern...sometimes there are gaps in time better one letter and the next...I plan to fill these gaps with other information relevant to him and his regiment. As I post each letter, I will create a corresponding link on the right side of the webpage to provide easy access and reference as you read each posting. I hope you enjoy the history of this common soldier during the most tumultuous time in our nation's history. September 3, 1861 -- Camp Curtin, Harrisburg, Pa.
October 19th, 1861 -- Fortress Monroe, Camp Hamilton, Va.
August 9, 1862 -- Fredericksburg, Va.
December 16, 1862 -- Broadstreet Hospital, Philadelphia, Pa.
December 20, 1862 -- Philadelphia, Pa.
December 24, 1862 -- Philadelphia, Pa.
John W. Derr (JWD) was born in Barry Township, Schuylkill County, Pennsylvania on October 7, 1839. He enlisted in the Union Army in September of 1861 and was mustered into the 48th Pennsylvania Volunteer Infantry, Company D at Camp Curtin, Harrisburg Pa, in that same month. From Harrisburg, the 48th PVI transitioned through Baltimore, MD and then down the Chesapeake Bay to Fort Monroe in Virginia. From there, the 48th PVI was attached to the larger Burnsides Expedition to North Carolina (Hatteras/New Berne area). After the North Carolina expedition the 48th PVI was moved north and participated in the 2nd battle of Bull Run, where JWD was wounded on August 29th, 1862 and taken prisoner. He was paroled by the Confederates, and was transported to Georgetown College Hospital in Washington, D.C. After staying in Washington and missing the battles of Antietam and South Mountain, he was transferred to the Cherry and Broad Street hospital in Philadelphia, Pa in December of 1863. He was subsequently furloed home for further recuperation. In addition to his participation in the Petersburg Siege, JWD participated in the 1863 Army review by President Lincoln in Washington, D.C., the Grand Review of 1865 in Washington, D.C. He was mustered out of the Army in July of 1865 and returned home to live out his remaining short life, dying on January 12, 1876 at age 37. The 48th Pennsylvania Infantry. . . Copyright 1996 - James P. Derr. Awesome Inc. theme. Powered by Blogger.